They are in his library, his fridge and tattooed all over his forearms. Insects are an integral part of Florian’s life. In the near future, you may even find them on your plate. 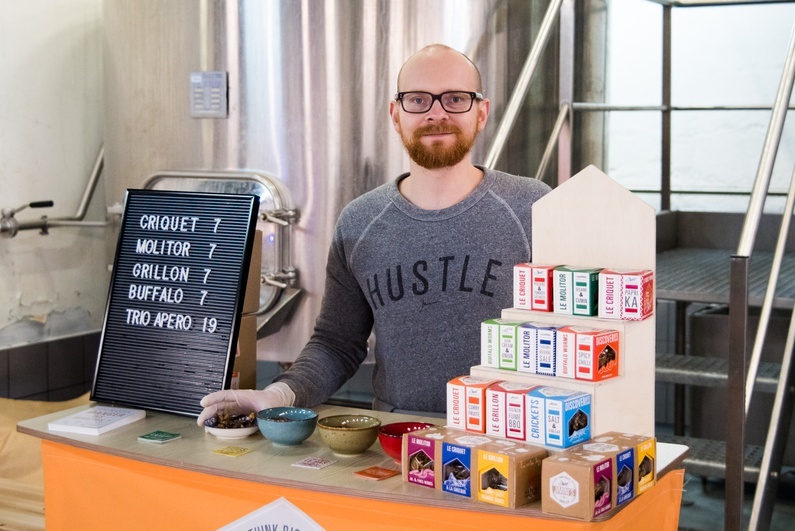 The 30-year-old Parisian works at a small company whose employees have dedicated their lives to producing and selling crunchy insect appetizers. Five years into this love affair, Florian won't quit. On the other side of the stall, Florian has set up a small pyramid of cardboard boxes. Each box contains different kinds of insects. They are flavoured to suit everyone’s needs; with thyme and oregano, and even a Christmas edition that tastes like mocha. 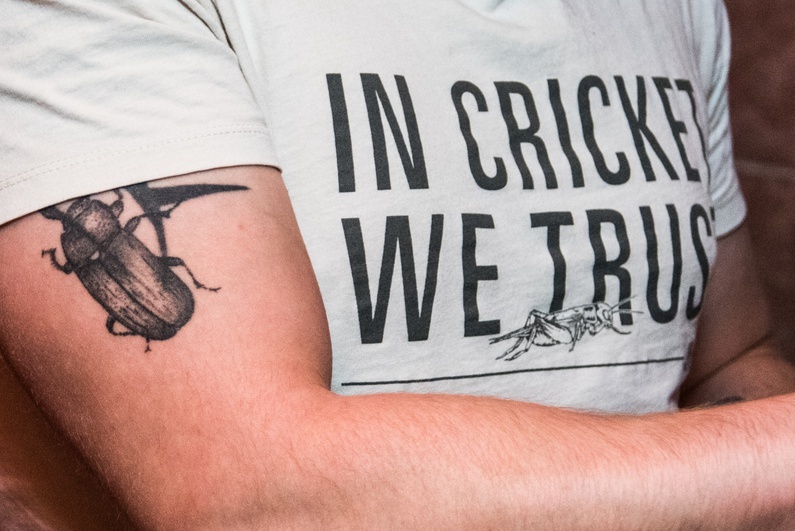 Florian Nock defines himself as an entomophagist. This means that he doesn’t only sell insects, but he eats them too. It’s not that surprising given that two billion people on Earth, living mostly in Africa, Asia and South America, consume insects regularly. When it comes to European cuisine, however, insects are an exception. Florian has been fighting to change this trend for five years now. He has a blog, he’s travelled to China, taken part in interventions in Detroit and led conferences in Italy and Spain. Simultaneously, he works for Jimini's, a company based in Paris that sells insects as snacks, energy bars, protein sources or as pasta online and in 450 different shops around the continent. Although the job is right down his alley, he still struggles to pay his rent in Montreuil, one of Paris’ many suburbs. From the outside, his apartment building seems impersonal and grey. But once inside, the narrow apartment somewhat resembles an alpine chalet. The hallway is decorated with wood and the kitchen is burgundy red. The first room on the left is Florian’s bedroom. “You’ll think I’m crazy now,” he says as he opens the door to his room. There is not a lot of space, just enough for a small bed, a cupboard and a desk. The furniture is stern. The few personal objects that are scattered throughout his room are all connected to his work. Florian keeps a terrarium with larvae on his desk and a large cardboard insect on his bedside table. 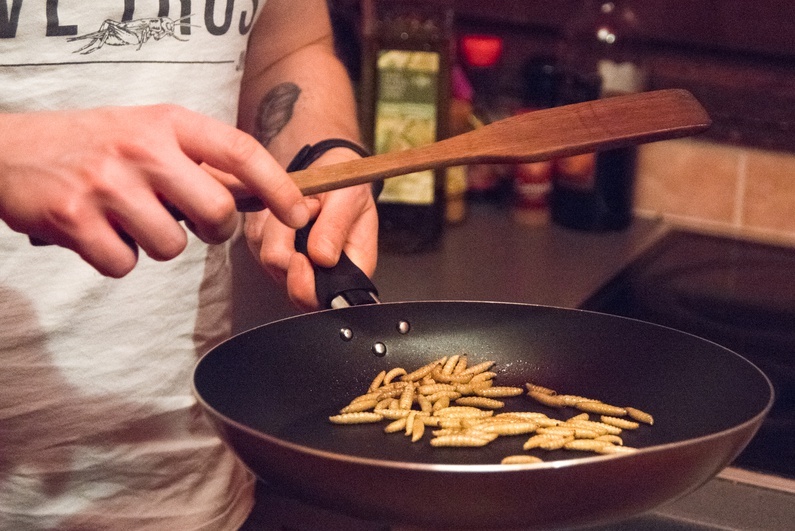 Florian Nock’s culinary mission is to provide a “healthy development” of entomophagy in Europe. He’s not the only one to believe that the integration of insects in our daily diets has important benefits. Since 2003, the Food and Agriculture Organization of the United Nations (FAO) has been researching whether insects could potentially become an alternative to certain types of meat. Agriculture and farming have proven to have a significant impact on global warming. “According to our estimates, the consumption (and production) of meat will have increased by 120% by 2050.” This is what is stated in the FAO’s agricultural report. So how is it possible to reduce toxic emissions when the global production of food will almost double? There will be almost 10 billion people on Earth by 2050. Based on how much the global population will increase, the FAO recommends creating more and more insect farms in Europe. Florian is convinced: “Insects are a great source of protein. Producing them is more ecologically viable than the way in which we produce protein today.” Contrary to pork and beef, insects need less space, require fewer resources (like food or water) and produce less greenhouse gasses. At the same time, insects have a higher percentage of proteins and nutrients than traditional meats do (at an equal mass). Florian’s fascination with insects is clear. But sometimes, this fascination has a negative impact on his relationships with women. “Well it’s a shame but… If I had to make a choice…” the young bachelor admits. His colleague made a good point the day of the market, though. Insects spark curiosity. 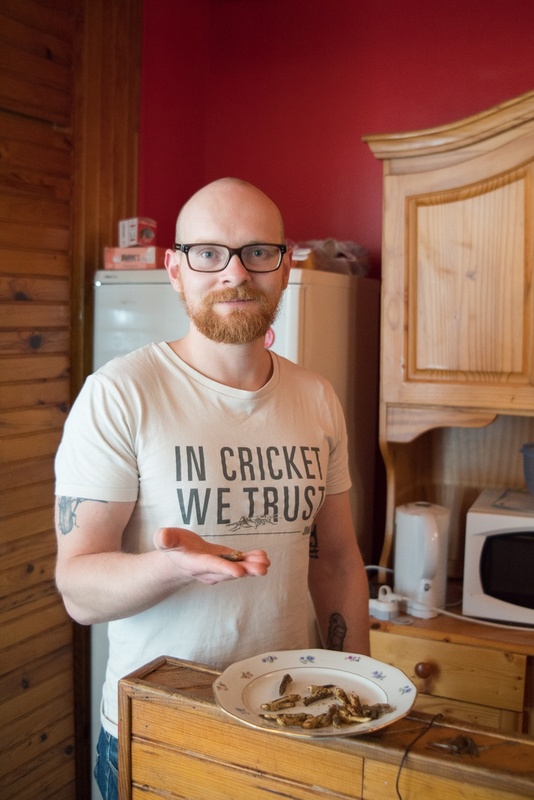 Even if Florian Nock doesn’t breed insects at home, you just have to take a look inside his fridge to find a pack of mealworms lying next to his roommate’s minced meat. They aren’t approved for consumption (in France, ed.) and are only used to feed birds. This is why we can’t film the logo on the wrapping. “Today, many companies are playing with legal loopholes. There is no real legislation in place for insects. We can consume them, but we’re not sure whether or not we can sell them,” Florian explains. Last summer, Switzerland became the first European country to allow the commercialisation of insects as an eligible food product. But since January 2018, this legal grey zone has changed. Approved in 2015 by the European Union, a new set of regulations on new food products was put in place, indicating that in the future, food permits will pass through the European Commission. Insects are fit for consumption. However, they still have to be approved by the European Commission depending on the species. “We’ll be able to work in every European country,” says Florian enthusiastically. In Europe, the idea that insects could one day become a food source was born 10 years ago. “Initially, several researchers visited different African and Asian countries, consumed insects and learned about the environmental aspects of insect production,” explains Florian. They saw insects as a concrete solution to tomorrow’s problems. After this research was carried out, an insect farm was built in Wageningen University in the Netherlands, where insects were bred for human consumption. Back in the day, Florian hadn’t heard of this field. He started off by studying environmental sciences and later moved on to study nutrition. He explains that this change of heart partially came from a childhood trauma: he was obese before he suffered from anorexia. Today, nutritional and calorie charts still decorate the walls of his room. Even if the academic life was made for Florian, finding work was difficult. “I’ve failed many times,” Florian explains, “I wanted to do something I loved doing, rather than just work. I read a book that I really enjoyed about the way in which we can achieve excellence in a field, about how we can become experts.” He recalls the exact moment in which he realised breeding insects would be a good idea. He was in his car. “I didn’t have a eureka moment, it just came to me like that. I think that I saw a documentary a few days before,” Florian says while smiling. During this period, Florian’s bookshelves became filled with books on insects, such as Bugged: The Insects Who Rule the World. Today, these books are mixed with science-fiction novels along with Total Recall with Arnold Schwarzenegger. Insects: the future of sushi? Shortly thereafter, he started his own mealworm farm. He bought his first worm in a fishing shop (but didn’t manage to get his farm started). “Now there are farms for human consumption, but at first [the worms] were just for fishing,” Florian explains. The second time around, he managed to ‘harvest’ his first batch of worms but didn’t eat them. The conditions in which the worms were raised were too uncertain, and so was their nutrition. This is precisely why so many Europeans are adverse to this new discovery. In August 2017, a survey carried out by the Deutschen Presseagentur (a German press agency, ed.) found that more than half of the German population “cannot imagine eating products containing insects.” This has nothing to do with taste; most of them have never even tasted an insect before in their lives. It has to do with a theoretical behaviour, according to the experts. Florian agrees with this theory, based on his own experiences in Strasbourg. He had already begun his story with insects: “At first, people said that I was completely crazy. In Strasbourg, we started from scratch. Nobody wanted to eat them but little by little the idea started to grow, and now people agree.” Still, most people think insects are dirty and refuse to have them in their kitchens. In 2015, the National Health Security Agency stated that 100,000 people could “potentially” have an allergic reaction after eating insects. But “it all depends on the way we farm them,” Florian retorts. Young people are often spontaneous. Most of the time it’s children who, courageously and without hesitation, accept Florian’s invitation to taste worms, crickets or grasshoppers from his stall at the market. Throughout his travels, he came to realise the differences between countries. “France and Germany, all western and central European countries, are much more open [to the idea]. It’s much harder in Spain or in Italy. People are even more faint-hearted. But it’s slowly starting to work,” says the young Frenchman. He even knew an Italian colleague who made insect-based noodles. And even if tasting insects works well in France, it’s much more difficult to integrate eating insects in the population’s daily diet. Insects are far from representing a complete portion of proteins in a meal. “It’s difficult to replace a real portion of meat. That’s why I mix vegetables with high protein concentrations and insects together,” Florian explains. Except for insects, his diet is entirely vegetarian. “With their proteins and vitamins, insects are only a nutritional supplement. What’s more, they are crunchy and taste good.” Still, to replace an entire steak, you would need 100 grams of insects. “This is still a huge amount,” Florian adds, whose company is currently working on an insect-based steak. “Today, the sector is still developing. That’s why it’s difficult to finance it, but insects could become a great source of food. They are not just toppings for your salad.” Florian’s journey these past five years is proof of his optimism: “I started with a small blog in my room and a farm in my kitchen, but I still managed to work in China, hold interventions in Detroit and lead conferences in Italy and Spain.” So, can insects give us wings? Voglio Mangiare Così is a series of portraits that show what's being eaten by young Europeans today. A little out of whack, a little political and a little weird, these eight portraits embody what it means to follow an alternative diet. Do you want to write for Cafébabel? Then pitch your idea here.